Helen is one of our most experienced physios and has been with North West Physiotherapy since early 2006. 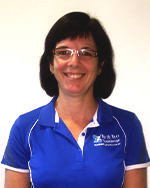 Helen has many years of experience treating musculoskeletal problems both in Australia and the UK. She has a particular interest in ongoing rehab for spinal patients via pilates exercises and also uses acupuncture/dry needling as part of her treatment if required. Helen works part time at the clinic, on Tuesday and Thursday evenings.